Let's build this using UIPageViewController and UISegmentedControl. We start with a blank storyboard, drag out a UIPageViewController and set it as the initial view controller. Then drag out two UIViewControllers to switch between. We'll select the page view controller and choose Editor > Embed In > Navigation Controller. 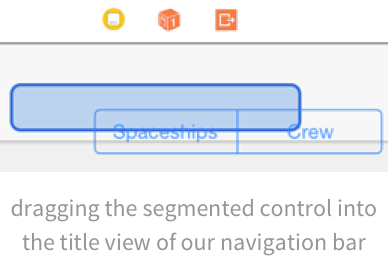 Then we drag out a UISegmentedControl and drop it into the title area of the navigation bar of our page view controller. Finally, we create an @IBAction function that will get called when the selected segment changes. The code is pretty straightforward, note the use of R.swift to grab those two view controllers from our storyboard. (covered in Bite #52).